Suffering from any of These Dental Problems? 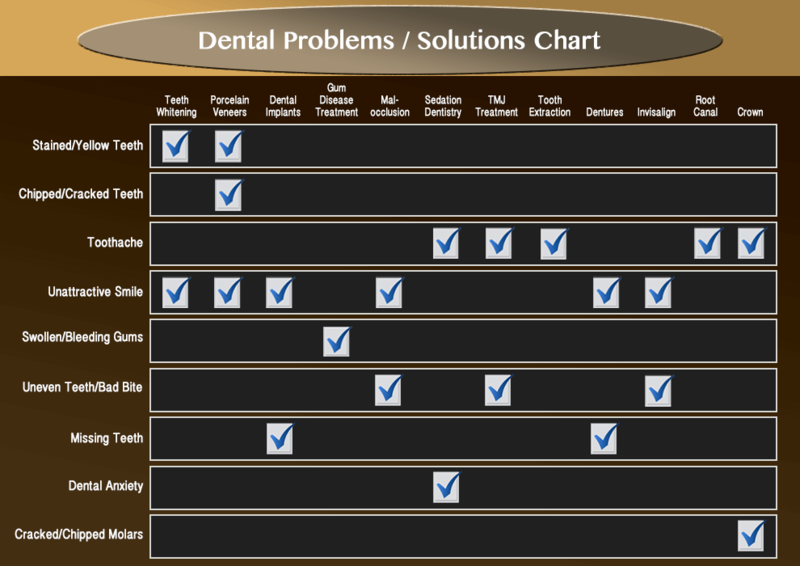 If you are browsing around our website, then chances are you have one or more dental issues that need attention. At Smiles at Fairfax Corner, we are here to meet all of your dental needs. If you are suffering from any of the problems above, then you are most likely a candidate for one or more of the many services that we have to offer. Teeth whitening, veneers, and Invisalign clear braces can absolutely do wonders for your smile. Whether you are unhappy about stained/yellow teeth, crooked teeth, chipped/cracked teeth, a bad bite, or uneven teeth, we can help. Our patients absolutely love the results they get when choosing our cosmetic dentistry services. So if you are unhappy with your smile and you’re ready for a brand new smile, call our office today. A consultation appointment is the first step to find out which cosmetic dental services are right for you. Dental implants, crowns, bridges, dentures, root canal therapy, and tooth extraction can solve the most common dental problems our patients face. Our team of dentists are trained to determine which procedures are the best for your smile. The consultation appointment is the first step in this process, so be sure to schedule an appointment today. We can help you if you’re suffering from missing teeth problems, a horrible toothache, or cracked/chipped molars so give us a call today. At Smiles at Fairfax Corner, we also offer TMJ therapy, sedation dentistry, malocclusion options, and gum disease treatment. If you have high dental anxiety or dental-related fears, our sedation dentistry options can help you relax and feel comfortable. Patients absolutely love sedation dentistry. Our well-rounded dental services are sure to solve your dental problems and concerns about your smile. If you are in the Fairfax area, and need a dentist you can trust who can solve the dental problems you are experiencing, then give us a call today, or contact us here.